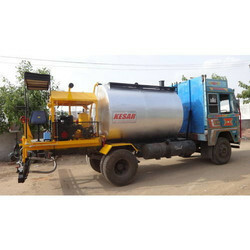 Kesar Truck Mounted self propelled Bitumen Pressure Distributor are built with original technology from Germany. These Distributors are designed suitable heating system and variable Spray Bar to operate on constant pressure system. Complete with Engine, Air Compressor, High Pressure Positive Displacement Bitumen Pump, Specially Designed Spray Nozzles, Electronically & Manually measuring systems of Bitumen temperature & Truck Speed, Tank Burner, Hand Torch Burner, Proxy Sensor, High Quality Valves etc Standard accessories.The equipment is capable of applying a unvarying, unbroken and prescribed quantity of hot bitumen or cold emulsion on a specified area, Machine is safe and easy to Operate. Capacity 4000 to 10000 Ltr. 'KESAR' is a leading supplier of Bitumen Pressure Distributor ( Truck Mounted) and machinery, with the focus very firmly on road building. Ever since we established, we have been setting benchmarks in the road-building industry, thanks to countless innovations and solutions which are as competitive as they are dependable. True o our motto - “High Productivity, Performance & profitability” - we gear our activities totally to the needs and requirements of our clients across the globe. 'KESAR' Bitumen pressure distributors (Truck Mounted) gives uniform, unbroken and prescribed quantity of hot bitumen or emulsion. These units can be supplied as a module to suit mounting on customer's truck chassis or can be supplied completely along with standard truck chassis. The 'KESAR' Bitumen pressure distributors ( Truck Mounted) series offers customers the finest & proven technical solution, with international product support, latest generation process controls and automation together with total installation and site support, aimed to deliver productively and profitably. KESAR' horizontally folding spray bar is supplied with a basic width of 2.4 Meter extendable up to 4.2 Meter or optionally up to 4.5 Meter. The Fully circulating spray bar can deliver bitumen at pressures ranging from 0- 6 kg/sq m. All units are supplied with an inbuilt bitumen charging / loading system. The bar is supplied with nozzles at a standard pitch of 225 mm, pneumatically operated and easily adjustable. The unit has a built in heating system with a high capacity burner to heat the bitumen to the required temperature. Various fuel options as well as burner options are offered on specific requests. The Insulated Storage tank clad with Industrial gauge steel sheets built strictly to Industrial codes for storing, handling and transportation of Hot Bitumen. The cladding is optionally available in a wide range of options ranging from Galvanized, Aluminium or Stainless steel sheets. Each unit comes loaded with a speed detection & driver control system, twin cylindered air compressor, 25 HP air cooled diesel engine, High capacity positive displacement internal gear type asphalt pump, remote control station, hand spraying attachment and barrel heating arrangement. A unique pressure cleaning system is a standard, which cleans the system after use and avoids clogging at the end of days work. This reduces the up time for the next day or at next job site. 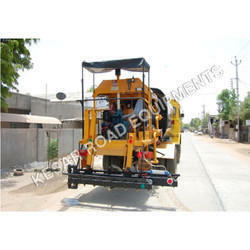 "KESAR" has rich experience in the field of Road Construction machineries especially in road construction coupled with the world best technology, guarantee, reliability and productivity In addition, our stringent quality control checks and wear tests ensures higher quality for all our machineries. To know more or to upgrade your existing plant system with remote assistance, please don't hesitate call us now. Kesar Truck Mounted self propelled Bitumen Pressure Distributor are built with original technology from Germany. These Distributors are designed suitable heating system and variable Spray Bar to operate on constant pressure system. Complete with Engine, Air Compressor, High Pressure Positive Displacement Bitumen Pump, Specially Designed Spray Nozzles, Electronically & Manually measuring systems of Bitumen temperature & Truck Speed, Tank Burner, Hand Torch Burner, Proxy Sensor, High Quality Valves etc Standard accessories. 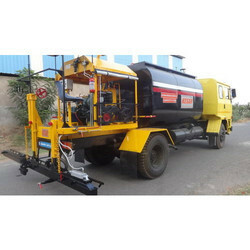 The equipment is capable of applying a unvarying, unbroken and prescribed quantity of hot bitumen or cold emulsion on a specified area, Machine is safe and easy to Operate.The unit can be supplied as a module to suit mounting on customer's truck chassis or can be supplied completely along with standard truck chassis. Totally factory tested, arrives ready to launch.